It’s Christian Bliss and I’m back to fill you in on how my week went. Monday- School was good was very happy I didn’t have homework at all today. Once I got home I went straight to my strength and conditioning trainer. We worked about for about 2 hours and got some good work in. We worked on a lot of different things today but especially my core. When I got home, I ate some good pasta with broccoli and chicken. 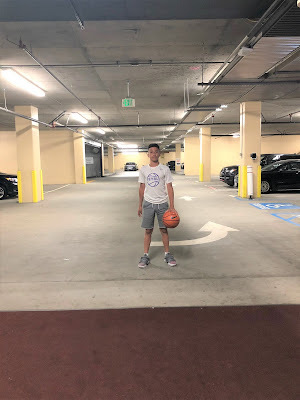 Then I went outside to the court and got some shots up. I worked on my fade away a little bit and then worked on elevating on my elbow jump shot. Tuesday- I took an ELA test and I felt I did well on it. When I got home I took a nap and when I woke up I felt very refreshed. Then I did all of my homework and headed to the gym. I went to LA Fitness and did almost everything mostly legs doing the toe raiders with weight, leg press and knee extensions. My coach also shows me a lot of exercises I could do for my back and upper body. So, I worked on that area for a little then I went to the basketball court and ran half court just to practice some moves I will do in game. I can’t thank my coach enough for everything he does for me. (Everyone follow him on Instagram @coachdrg2000).. When I got home at about 11:15, I took and shower and studied for my social studies test. I was always told by my parents I won’t be able to play basketball if my grades aren’t on principals list. I hope to maintain my 98 average last year. Wednesday- School felt to take forever and was very tired most of the day. But I knew I had to be ready for my workout right after school. Two hours straight every Monday and Wednesday strength and conditioning. It’s very challenging because every week there is another exercise added. But I embrace being uncomfortable in my workouts and use every workout to get better. We did a lot of quad and shoulder work today. I got home at around 5:30, ate dinner did and homework and was out to the high school workouts. THE GRIND DONT STOP!! Thursday- Today in school I had a science and Spanish test and also had picture day. When I got home from school, I went to Dante’s football game. He was playing 2 back and wide receivers, he had 2 touchdowns and had a couple of nice hits. But I always tell him he is scared to go against me because he wouldn’t know where he is if he got hit by me. After the game I got home and did a packet that was homework and it took me over 2 hours. By that time, it was around 8 so I did some push ups and sit-ups, then finished some other homework and went to sleep. I didn’t do any training today cause my body was very sore from yesterday and needed to rest a day. Friday- The week felt long because it was the first full week since getting back to school. When I got home from school, I went to the mall and got some clothes with my mom. Once I got back home, I went straight to the New York Sports Club and got some good work in. I did upper body for about an hour then I did core and legs for 30 minutes. To be ready for the school season this year, I mainly need to focus on getting my upper body stronger. So, I did a lot to work on that today and also did some core work to continue to get my core stronger. I am approaching my workouts at a different level and will be ready to ball out this year. Saturday- I relaxed most of the day then went to the gym later in the day and got some work in. I worked on my legs a lot today and do some lifting which I usually don’t do. I don’t lift at my age because I know my body is still developing but also, I need to get stronger. So, I lift once in a while and mainly do calisthenics to get my body stronger. For the rest of this year I am mainly focusing on my body more than anything because the biggest part of basketball is conditioning. Understanding that there is so much more than just playing makes working out so much easier. In order to separate myself from the rest I must put in a different amount of work. The gym is my second home!!! Sunday- I was excited for the first team practice today. But at the last second, I found out I was going to the Giants game which I couldn’t miss. My brother and I went to the game and had a great time. If you were to know me close you would know my brother is the closest person in my life. Even though the Giant's didn’t win, it was still fun to be at the game. We had great seats, 4th in the stadium on the Giants side. I had a great day and left back to Long Island for the school week. Thanks for reading about my week, see you guys next week.